Easy update directory listing and content using your iPhone! 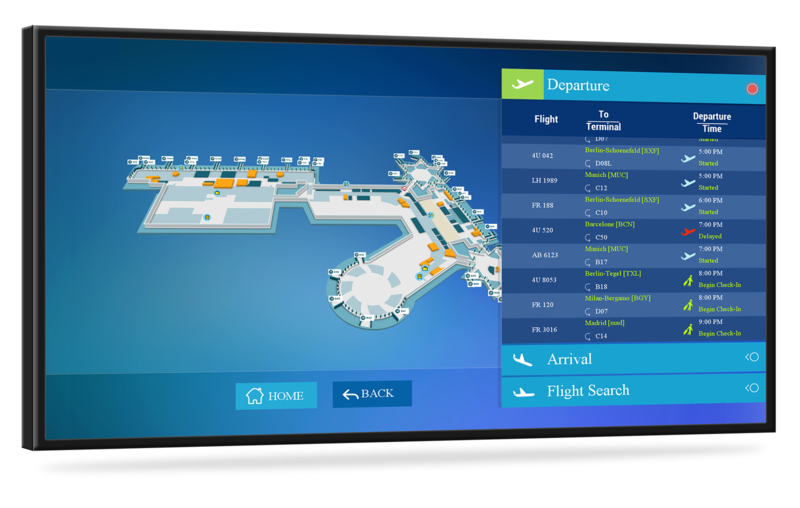 Available Sizes: 32", 43", 48", 55", and 65"
If you are looking for a touch screen digital directory solution, that is highly efficient, and includes all of the bells and whistles then you will love this easy to manage, professionally designed solution! 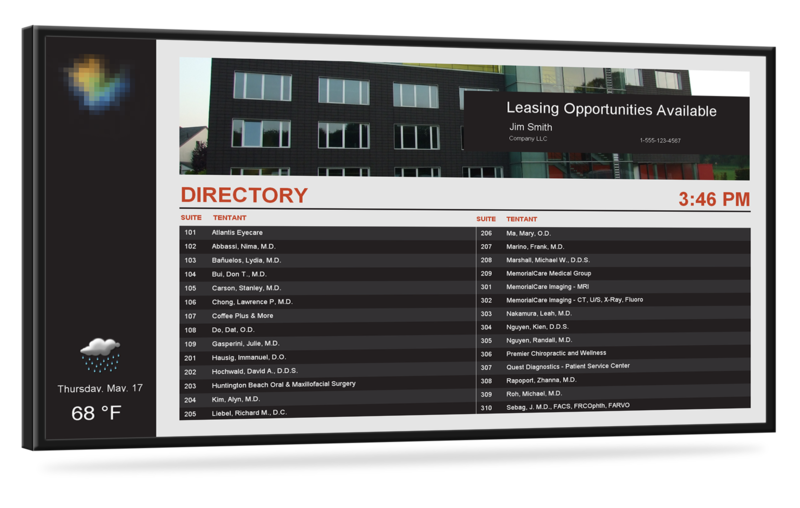 This all-in-one digital directory solution can seamlessly blend your organization's directory listings, facility notices, management and leasing information, event schedules, bulletins, welcome messages, area amenities map with local traffic reports, tenant information and important announcements into a compelling easy to use, immersive touch screen digital directory platform. 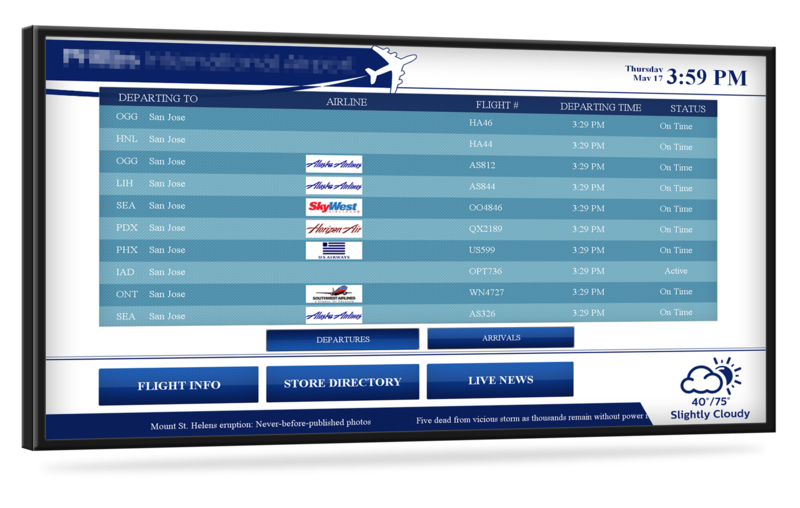 You will receive an out-of-the-box ready to use touch screen digital directory solution. 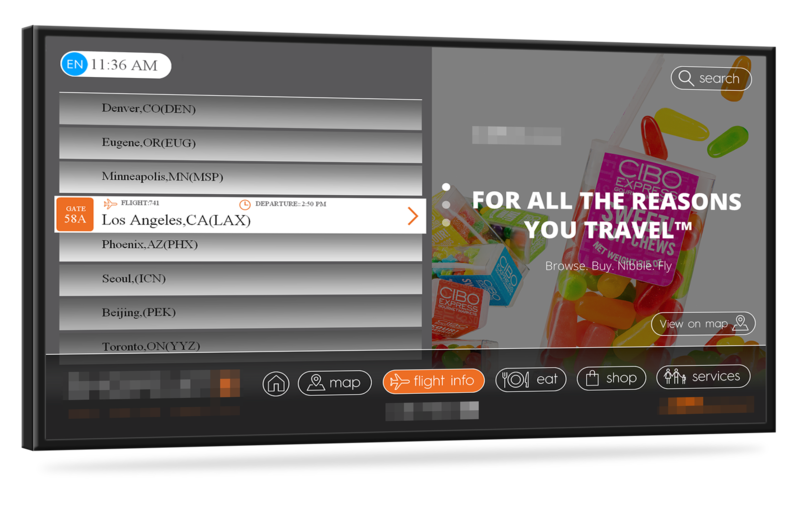 It will ship preloaded with your custom interactive digital directory content, digital signage directory software, and media player. Tell us the features you need then we will custom develop, test and set up everything for you. Dedicate a button to your company. This helps to increase branding while educating the public about your company, products, and services. 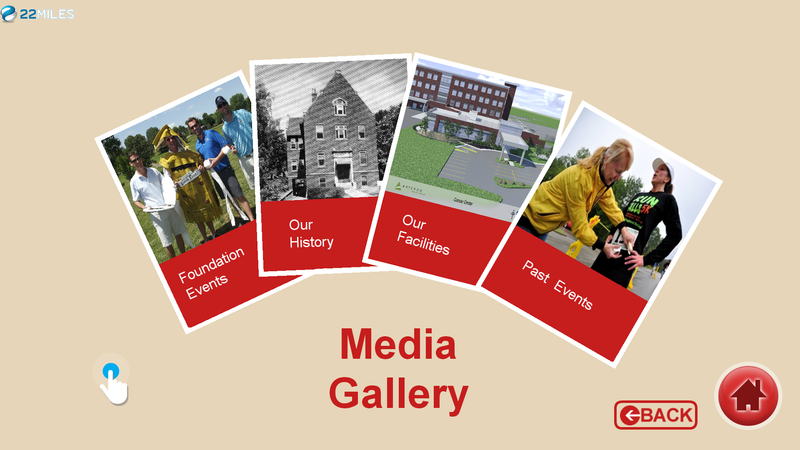 Images, videos, power point slides, brochures, flyers, or any other .PNG file can easily be displayed. 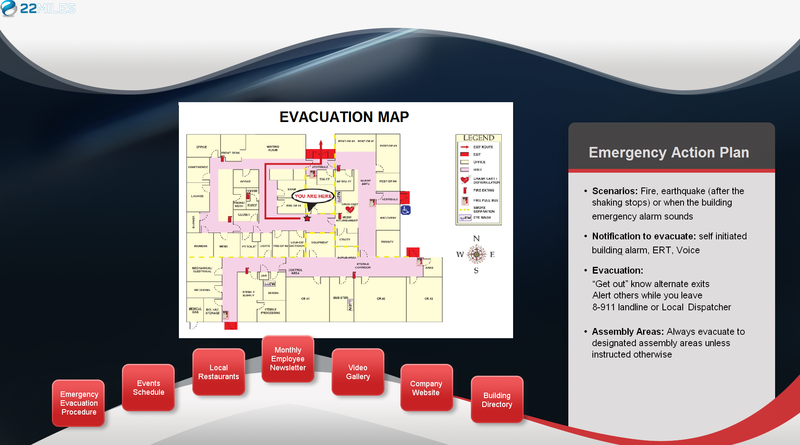 Eliminate confusion and help your facility respond effectively to a wide range of emergencies. 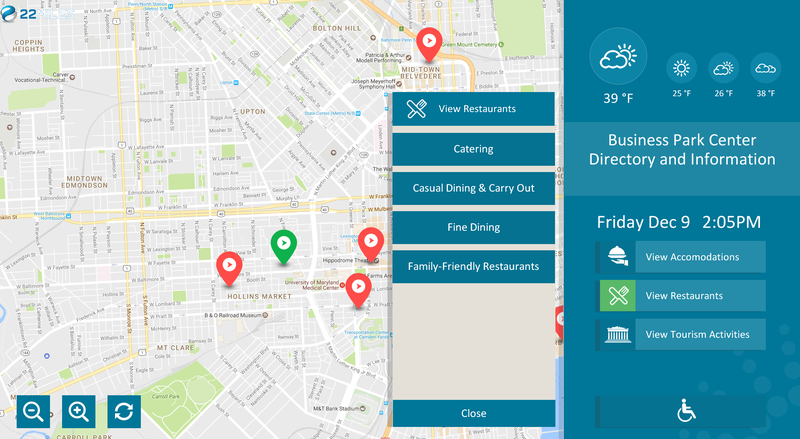 Make it easier for guests to search for and find information and directions to area business. Increase your organization's on-line presence by connecting your Instagram, Facebook, and other social media scrolling feeds. 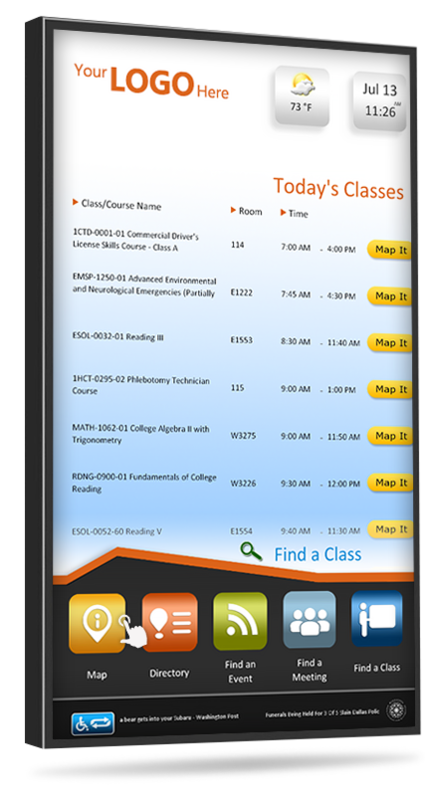 Add section or button that when selected features your organizations public announcements, building information, notices, educational bulletins, advertisements, services, and room schedules. 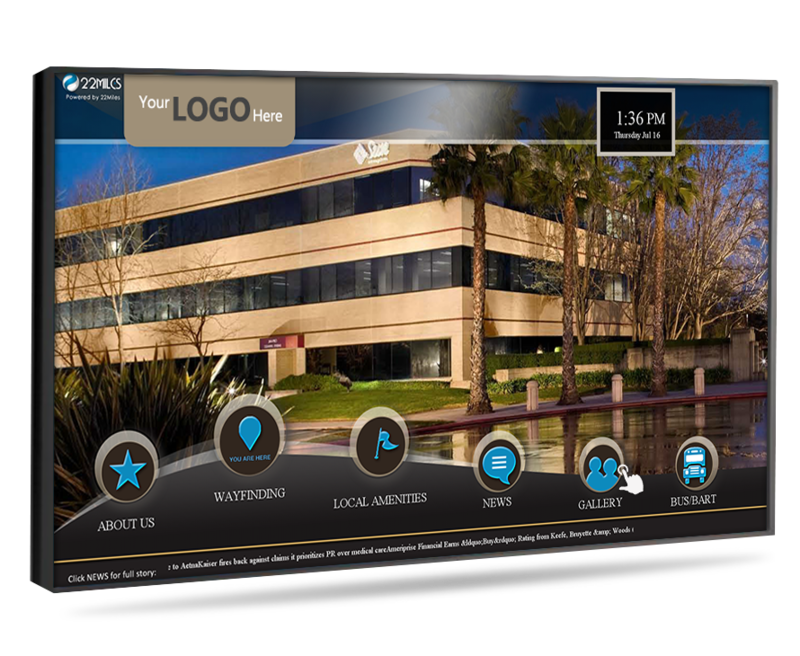 What is next?When placing your order simply let us know which features you would like and our graphics design team will creatively incorporate everything you need into the digital signs interface. Remember, you can select as many features as you’d like and you’ll always receive the same flat-rate price from us. We do not bill by sets of features, by "slides" or design time. Up until now, property managers have had to pay to print new directory listings then take time out of their busy day to drive to the building and update the listings. This is expensive and takes an average of 2 hours to do. 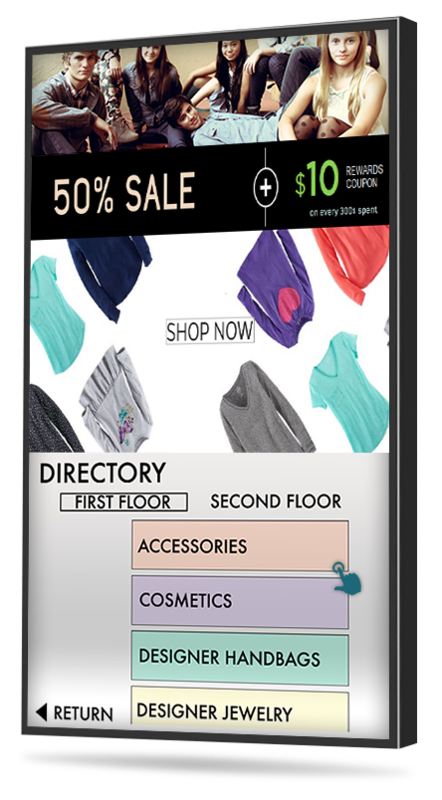 The new TouchPlus+™ digital directory solves these dilemmas while improving experiences. Let me explain. 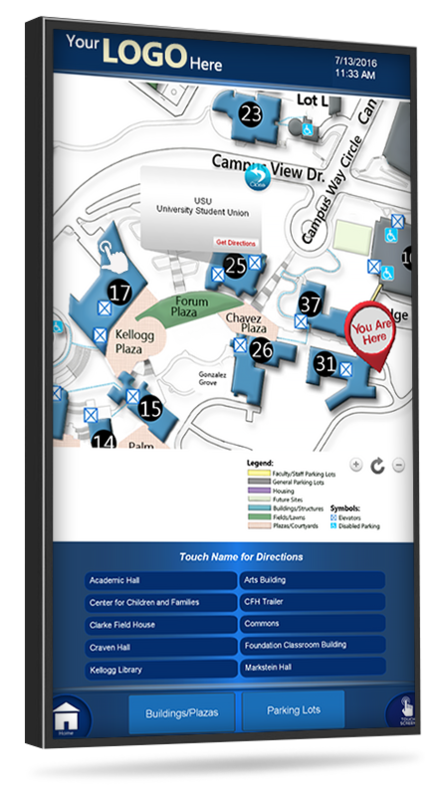 Through ingenious planning and implementation of touch screen directory software, we can now seamlessly blend your organization's directory, facility notices, and other relevant news into a compelling easy to use, touchscreen digital directory. Remotely manage and update listings, names, descriptions, images, announcements, and other media directly from a computer or cell phone. All changes are wirelessly sent and up-to-date on to the within in 60 seconds! 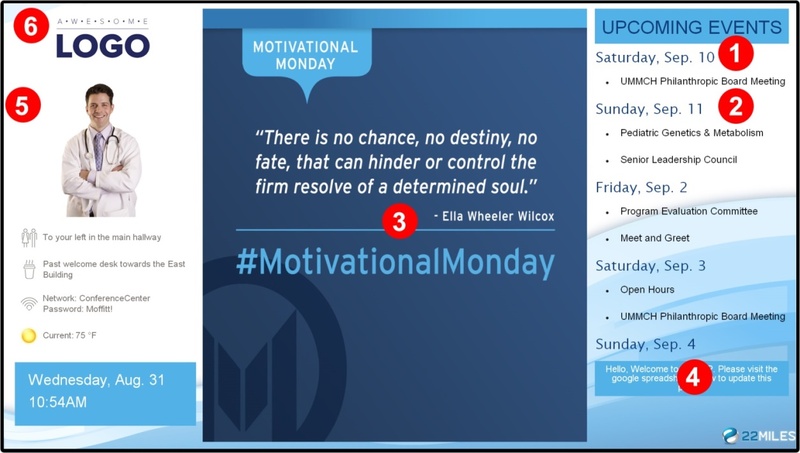 Click here to read more here on content management. Once the system is installed, it is self-operational. Settings can be applied for pre-scheduled Power ON / OFF. Every time the system turns on the directory software automatically loads itself. Our design team will create all of the directory content, touch screen buttons, graphics, and prepare everything for you. Once installed, the directory is self-operational and requires zero on-going maintenance. Click here to read more about the content creation process. 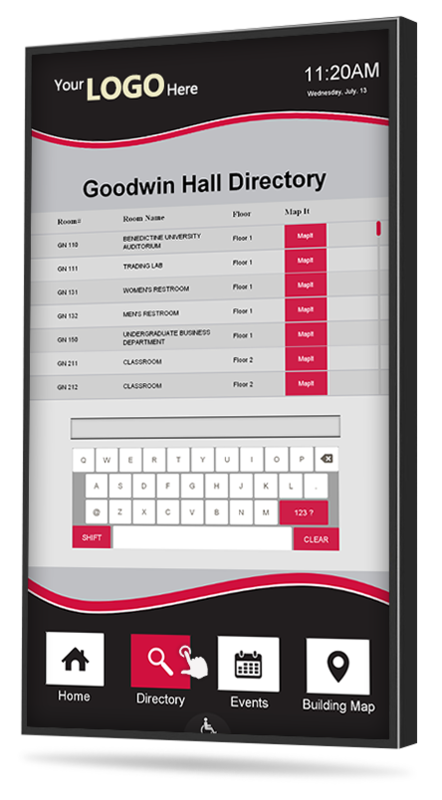 A good touchscreen digital directory system is practical and easy to use . . . 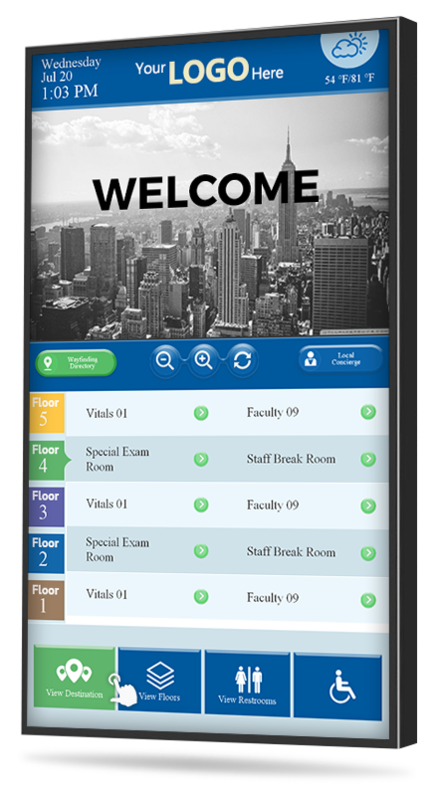 This system is perfect for receptionists, front desk employees, property managers, and any other non-technical individual. With the TochPlus+™ touch screen digital directory system users can master editing, updating and managing content within 15 minutes. When creating the digital directory content, we will set-up the Google account for you. You will use this account to make changes to the directories information and listing. Your username and password credentials will be provided to you after the system is installed. 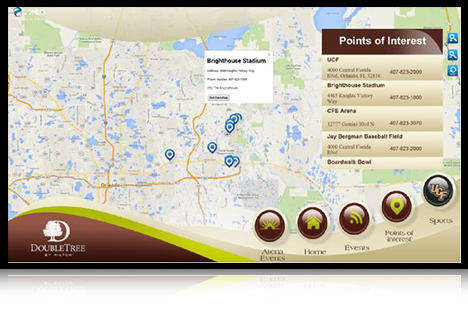 We will sync the directory listings, text, images, and other media zones with Google Drive and our proprietary digital signage software. This advanced integration will make it easy for you! To edit a content zone simply make an update to the proper column featured in the Google Drive Spreadsheet we set-up for you. The numbers 1-6 in the example above represent the media zones that are connected to the cloud-based Google Drive Spreadsheet. Once you have made your update in the Google Drive Spreadsheet, our software will instantly do the rest. Let me explain. 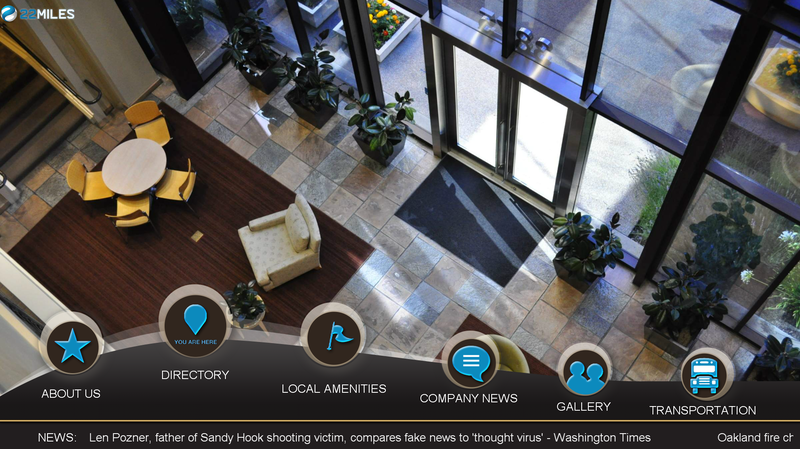 - Our software will auto resize every image you upload, so it properly fits the media zone you want the image featured. 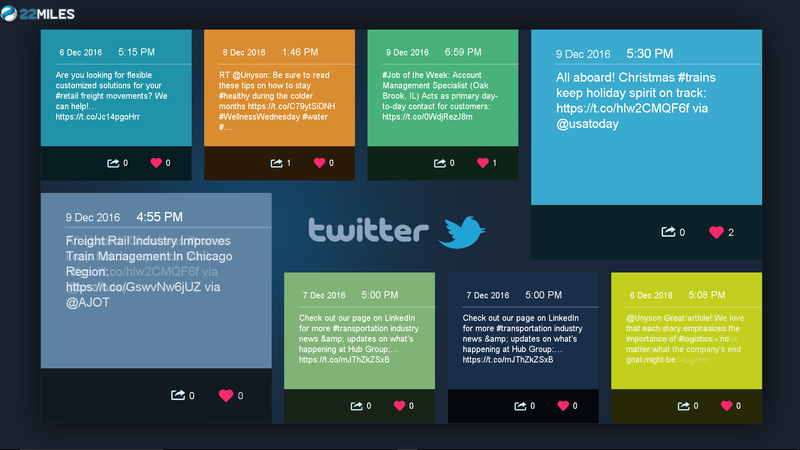 - All text updates you make are auto-optimized to match the font size, color, and style of content. - Every update you make is saved and wirelessly sent to the display within 60 seconds. Live RSS news feeds, weather forecasts, local time and date, streaming URL based cable feeds, scrolling tickers, local area traffic reports and maps. 1. Google Drive is mentioned as a content sync location. Is this an account that our organization would need to create or is this accessing a vendor's account? 2. Do the clients call to anything else outside of our firewall besides Google Drive? 3. For Network Load, is the content just pulled from the Google Drive location one time, cached locally, then stream it? 4. Is it reloaded on a regular interval, if so what is the frequency? 5. What is the maximum file size that is supported? Documents: Up to 1.02 million characters. If you convert a text document to Google Docs format, it can be up to 50 MB. Spreadsheets: Up to 2 million cells for spreadsheets that are created in or converted to Google Sheets. Presentations: Up to 100 MB for presentations converted to Google Slides. When we are working with you to create your digital directory, there are multiple design suggestions that we will review with you. We have pulled together some design principles that will help guide you through making the right decisions. These suggestions will assist you in making sure that your digital directory meets the needs of your customers and visitors. There are two orientations available; portrait, and landscape. The orientation of the directory will depend on the total number of listings you have, the size of the display, and how much space you have to mount the display. You may also want to consider whether you will be placing multiple displays next to one another. 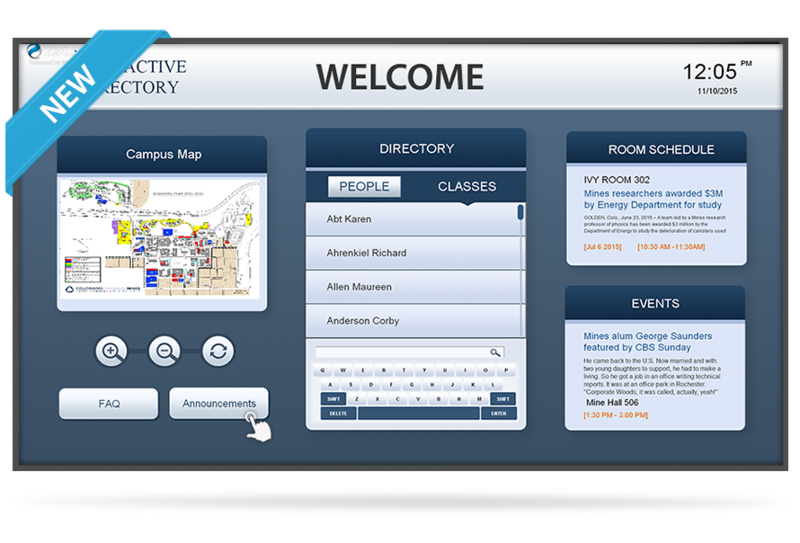 It might seem like a given, but legibility is the most important aspect of your touch screen digital directory. It can be challenging in the design process, but the digital directory font sizes must be large enough to be recognizable from a distance. For individuals standing just a few feet away, it is important that the size and font selections be appropriate. Sans Serif font and depend on the size of the display, 20-30 point font is recommended. Take into consideration that some individuals may not have the same eyesight capabilities as you do. When it comes to the visual layout of the directory listings, we recommended the proper balance of white space. 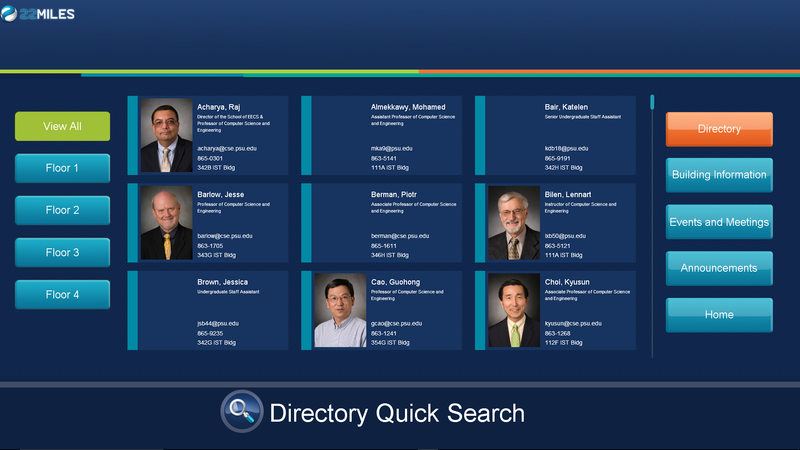 This will help the digital directory directory not look overcrowded. It is also recommended that the use of bold font, images, varying colors, and sizes to be limited to just the sections that you desire to have emphasized to be called out over the other sections within the directory. If the listings do not fill up the entire screen, it is okay because it will be beneficial to the reader. When it comes to utilizing directory images, it will be important to ensure they are the appropriate size, eye-catching, and high-resolution. One image that you might consider using is a map layout of your building. A map tremendously helps visitors with a visual representation of the building, where they are, and where they need to go. You can also the choice to add individual images of tenants, example: an image of a doctor from one of the practices listed in the interactive digital directory. Another option is adding a short description of the tenant and or contact information. We will make sure to leave adequate white space between images so that there is a visual gap between the text and the image itself. When selecting images, please make sure that they are images that your company has the legal rights to leverage. The theme for the digital directory should align with the same theme that is being leveraged on all of your promotion materials and website. This should include your organization fonts styles, logo and same color palates. If there no specific company branding that the touch screen digital directory is supporting, then we can apply more freedom the overall design them. If multiple businesses are listing, we always suggest a professional layout and use more generic colors. Some suggestions include having the digital directory listings organized by a particular category, suite number, per floor, or alphabetized format. If you choose the category approach, we recommend alphabetizing each listing within each category. 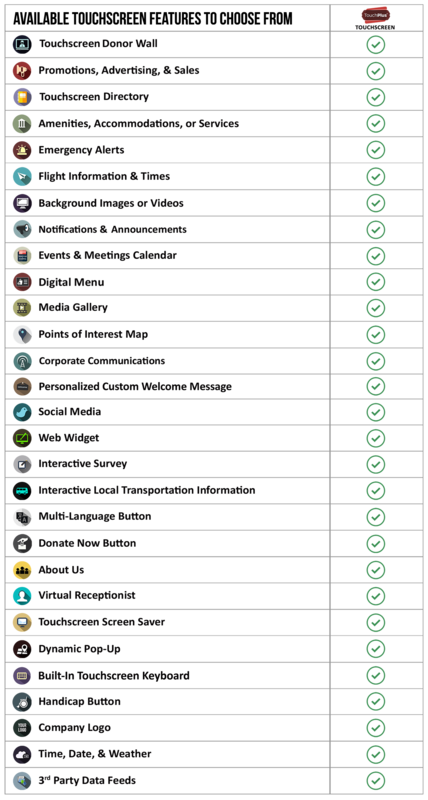 The categories should not contain the same font size and color as the sub-listings. Using alternate font styles will assist with the easiness to the eye. 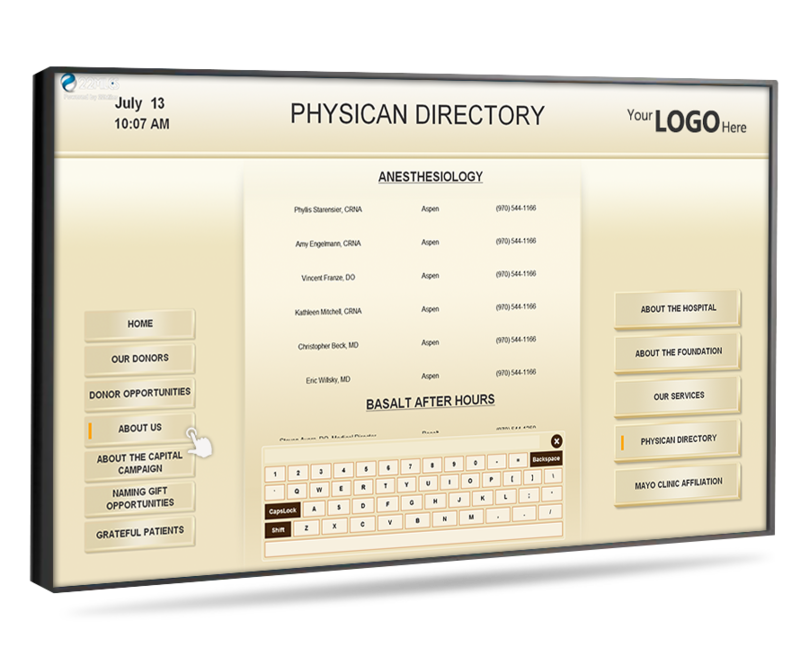 Have a design strategy will make sure that you do not go astray from the overall goal with this touch screen digital directory. While there are several possibilities, the design should be aligned to meet your overall objectives. In other words, don’t get so creative that people have no idea that your digital directory is, in fact, a touch screen digital directory. While there are a lot of design options available, it will be helpful to your building visitors if there is some level of consistency on the overall layout. 2-4 weeks. This includes custom content creation, software set-up, and shipping. Every TouchPlus™ solution is user-friendly and non-technical. • None.We handle every solution transparently by providing you with all available. 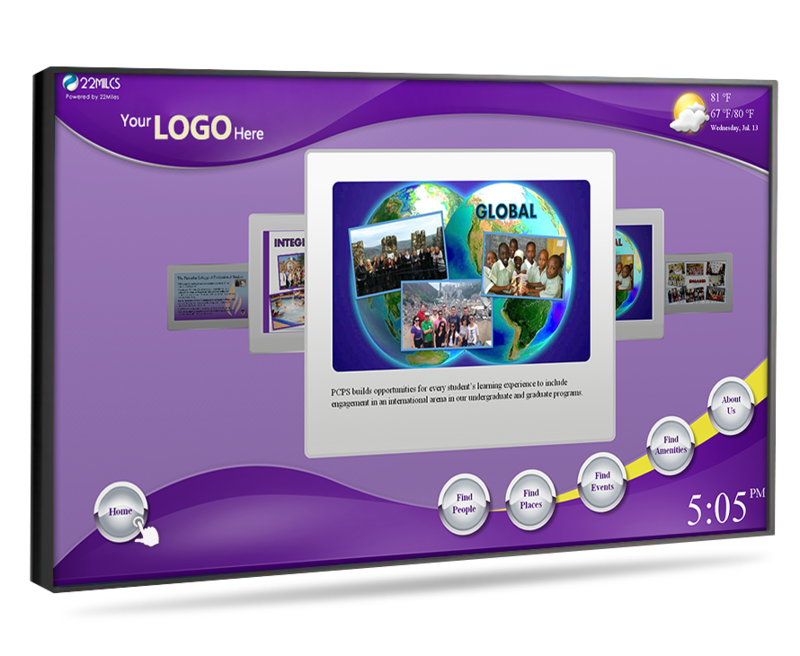 After your order is placed, we immediately begin creating your digital signage content. o We research your establishment to learn about your organization, products, & services. 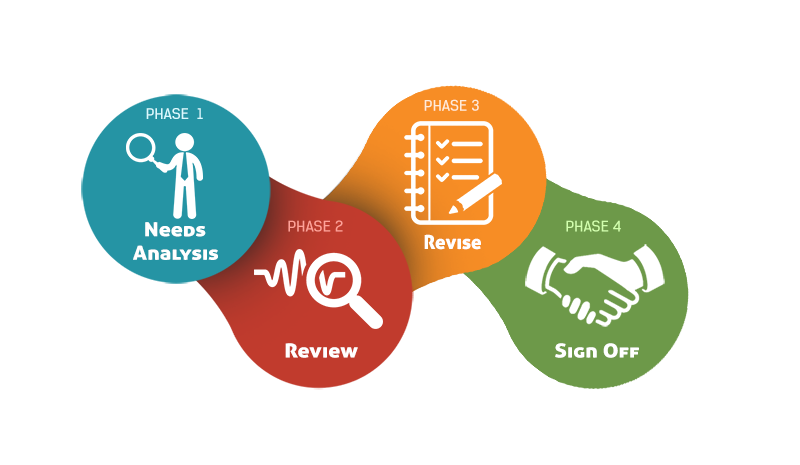 o We then have an initial discovery call with you to identify clearly your objectives and needs. o After the call, we draft a set of concept designs and send them to you for review and feedback. o Upon receiving your response, a full-color mock-up is completed and sent to you for review. 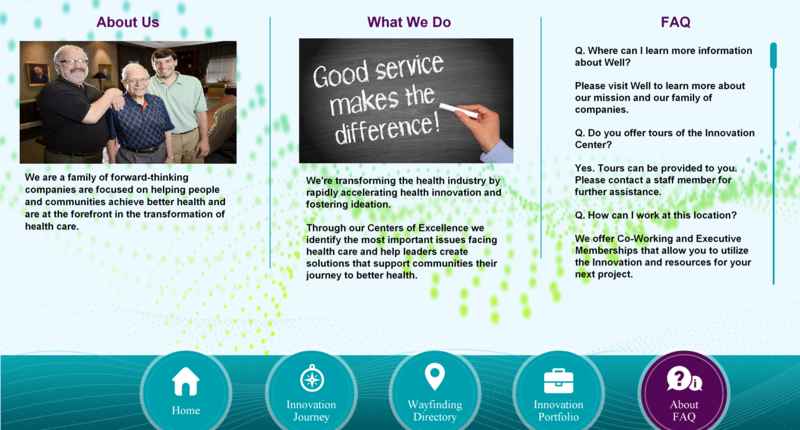 o Based on your feedback of the full-color mock up we make changes to the layout and its media. o When completed, we will have a short review call to review final full-color mock-up. o On the call, we will focus on how we can fine-tune the design, to exactly meet your needs. o Improvements talked about during our Review Call are made and sent to you for approval. o If you request changes, we continue making adjustments until the exact Look & Feel is reached. o The final design is submitted for your approval. o Once the final sign off occurs, we will configure and test every component of the system. o When you receive the system, a specialist will contact you for Step By Step Kick Off call. o On the call, we cover non-technical setup and make certain all of your questions are answered.